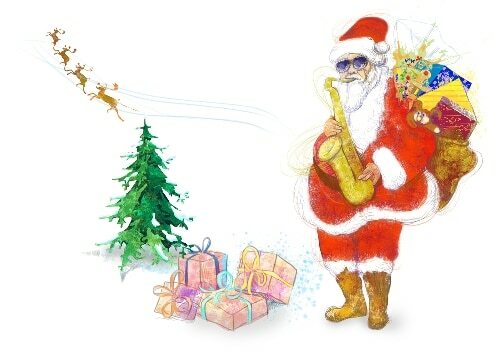 Did you know that in China, Santa Claus is often shown playing a saxophone? Can you sing “Deck the Halls” in Mandarin? If you answered “no” to both those questions, don’t sweat it. It’s never too late to learn how people in China celebrate Christmas! And what better way to learn Chinese than through a wonderful holiday that’s loved by so many? As you’re enjoying the festivities and expanding your stomach with delicious holiday food, why not also expand your mind with new vocabulary from some awesome Chinese Christmas songs and recipes? Sound intimidating? Don’t worry, everything you need to know you’ll find right here in this post. You’re probably really eager to start learning all about Chinese Christmas traditions and customs, but before we begin, let’s take in a quick overview of Christmas in China. And before I lose those of you who get bored when it comes to learning about the history of anything, don’t worry, because there’s actually not much history at all! Since the holiday of Christmas has European origins, you’re probably thinking that not too many people celebrate this holiday in China, and you’d be right. Christmas in China is still relatively new due to the fact that only an estimated 5% of Chinese natives are Christian. It’s not even recognized as a national holiday, and in many rural areas it’s almost unheard of. That being said, those who do choose to partake in this festive day may do so in all sorts of ways. Some are similar to Western traditions and others not so similar. So let’s get into some of those similarities and differences, and get you started with some cool Chinese Christmas lingo. If you’re familiar with Christmas at all, you probably know all about Santa Claus and his crew in the North Pole making gifts for all of the wonderful “good” children—who leave cookies and milk for him as he delivers presents all throughout the night of Christmas Eve. Now in China, the story of Santa Claus is a little bit different. He’s still often depicted as a jolly old man who wears red and white, but instead of being seen as a person who just delivers presents, he’s actually more of a symbol of good luck and fortune (who is sometimes seen playing a saxophone, for reasons that aren’t entirely clear). On Christmas Eve, Chinese children usually don’t leave cookies and milk for Santa and they don’t write letters discussing their Christmas wishes to him, either. Despite all of the above being true, if Chinese children ever encounter Santa out in public, they’re likely more than happy to see him, as he gives them treats and takes pictures with them. Do you love caroling along with classic Christmas tunes like “Deck the Halls” and “Rudolph the Red Nosed Reindeer”? Do you also wish that you could sing the lyrics to these songs in Mandarin Chinese to help you get better acquainted with this unique language? If you answered “yes” to both of these questions, then you’re in luck, because believe it or not, lots of Chinese people love Christmas carols, too! It’s never been easier to sing some of your favorite holiday songs in Mandarin. A great way to learn how to speak new languages is through repetition and that’s just one reason why using songs to help you remember new words can be very useful: It’s all about being repetitive in fun, catchy ways! For a cool challenge, try actually singing some of your favorite Christmas songs in Mandarin Chinese. For more authentic Chinese videos about Christmas and a huge variety of other topics, check out FluentU. FluentU takes real-world videos—like music videos, movie trailers, news and inspiring talks—and turns them into personalized language learning lessons. Most Christmas songs tend to focus on the same topics and are relatively short and simple. Here’s a list of Christmas words that you might come across frequently in songs. If you look it over now, they’ll already be familiar to you. Having this list around will probably help you remember the lyrics better, too, so keep it on hand! It’s hard to imagine celebrating any holiday without there being food involved! For most holiday meals, people cook certain special dishes just for these occasions. Chinese people who celebrate Christmas are no different, although most prefer to eat out with friends and family at restaurants and hotels rather than prepare traditional home-cooked meals. Despite this, many delicious Chinese foods are common to have as a centerpiece for holiday meals. For example, 八宝鸭 (bā bǎo yā), or “Eight Treasures Duck” (a roast filled with a combination of eight different meats and vegetables) is basically the equivalent of a turkey for American Thanksgiving or a ham for American Christmas. An easy recipe for Eight Treasures Duck can be found here. Don’t get too hungry yet, though, because we still have a few other Christmas traditions and customs to cover! Just like in other places around the world where Christmas is celebrated, gift-giving is very common among those in China who celebrate. Typical gifts can range from traditional Chinese clothing to toys to money (usually in red envelopes), and just like with similar Chinese holidays such as the Chinese New Year, most of the people who receive gifts are children. However, despite the idea you may have of gift-giving being all about good intentions, there are actually several types of gifts that should be avoided in China, mostly due to symbolic reasons. 1. Clocks can symbolize time running out. 2. Umbrellas can mean that you want the relationship between you and the receiver to end. 3. Handkerchiefs or tissues can be used to initiate a farewell greeting, often between two romantic partners. 4. Anything in black or white should be avoided, as these colors are used for funerals. 5. Shoes can indicate that you and the receiver should go separate ways. 6. Anything in sets of four should be avoided, since the number “four” (四 — sì) sounds like the word for “death” (死 — sǐ). 7. Towels are usually only given out during funerals. 8. Sharp objects are used to cut things and this could mean cutting off relationships. 9. Green hats symbolize turtle shells, which in China means a form of cowardice and this usually implies that a man’s wife has committed infidelity. 10. White flowers or any cut flowers can be synonymous with death. Gifts are wonderful ways for people to show that they care for one another. In China, they’re typically purchased at malls or other big shopping areas such as department stores. Did you know that Christmas decorating in China is very similar to Christmas decorating in Western countries like the U.S.? Yep, in areas where Christmas is celebrated (usually major cities), it’s very common to see festive decorations such as plastic Christmas trees (known as “trees of light”), colorful lights, paper flowers and paper lanterns all around in the streets as well as malls and stores. It’s also very common to see Santa with his helping “sisters” (young women dressed in elf-like attire), standing around while taking pictures with children and giving out goodies, since he doesn’t do so on the night of Christmas Eve. In other parts of the world, it’s usually Santa and his little elves that are seen taking gift requests from children instead of his sisters. However, for reasons unknown, this notion was lost when Christmas was first being introduced to China. So besides all of the traditions and customs we’ve mentioned so far, what else is left? Well, another small Chinese Christmas tradition is to give away “peace apples” on Christmas Eve. These don’t have to be real apples. Both plastic and papier-mâché apples have been known to be given as gifts as well. So why do Chinese people partake in the giving of apples on Christmas Eve? It’s simple: The Chinese word for apple (苹果 — píng guǒ) is similar to the Chinese word for Christmas Eve (平安夜 — píng’ān yè). Yep, that’s all there is to this little tradition. Other Chinese Christmas traditions that have become popular in recent years include special holiday performances, like a production titled “Carol of the Bells” by the Beijing International Children’s Choir Program, as well as the partaking of fun winter sports such as ice skating or skiing at resorts. Caroling is really popular among Christmas celebrators, too. China’s major cities have also become more enthusiastic about decorating for Christmas, as evidenced by a 21-foot-tall Christmas tree made entirely out of glass being displayed in Shanghai. Now that you’ve learned about some of the common Christmas traditions of Chinese people, it’s time to let the festivities begin! And of course, don’t forget to practice your Mandarin Chinese skills while you’re at it. Good luck on your language learning journey and 圣诞节快乐 (shèng dàn jié kuài lè — Merry Christmas)!